Thank you to photographer Cassie Rosch, I met Mallory. From the first time I talked to Mallory on the phone, we just clicked. To be quite honest, when she left my house after her trial run, I felt bad because I talked her darn ear off!! Mallory has a very approachable personality so I shouldn't have been surprised to find that in her fiancé and family on the wedding day. It was a beautiful wedding and I was glad to be apart of it! And to close it off, an epic rap written by sister-of-bride Sara and performed by all the bridesmaids. Sad to say I missed this but glad Cassie captured it!! Working with Janie was such a delight---although we had just met, I felt like I was working with an old friend. I used Janie for a trial hair and make up run before our engagement photos, day-of hair and make up for myself and the bridal party, and then on-site styling during photos and a freshen-up after the ceremony. Janie brings an amazing balance of warmth and professionalism and I trust her amazing eye so much! 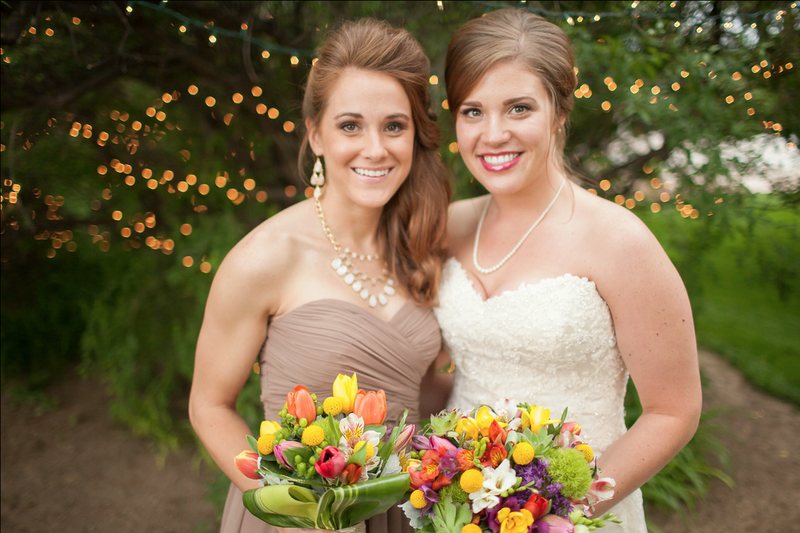 Janie helped me to feel absolutely beautiful on my wedding day which is a priceless gift! My husband and I had an outdoor wedding with a little (okay...a lot!) of rain---knowing that Janie was there to fix my dress, hair, make up seriously made me feel so much more relaxed.